Pick your poison with these double old fashioned glasses etched with caricatures of the seven deadly sins. Knock one back with these sinfully witty glasses, each etched with a cartoon personification of one of the Seven Deadly Sins drawn by award-winning cartoonist Mort Gerberg. Historically immortalized by literary giants like Dante and Chaucer, these infamous imps come scrambling out of the underworld as illustrated cautionary tales on the pitfalls of human vice. 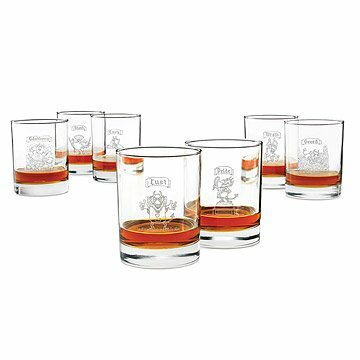 Gerberg’s characters are etched on classic double old fashioned glasses that will serve, whether you’re lusting after a dram of your favorite liquor or indulging in the gluttony of your third. Just remember your sin to keep track of your glass when imbibing with friends. Glassware made in New Jersey, decorated in Pennsylvania. Sold as a set of 7. Our 7 Deadly Sins Glasses also come personalized. You can find them here. To see the set of our 7 Deadly Sins Shot Glasses, please click here. To check out our 7 Deadly Sins Pilsners, please click here. Copyright (c) 2011 - The 7 Deadly Sins Glasses - Set of 7 artwork owned by Mort Gerberg and licensed to Uncommon Goods LLC. All rights reserved. Great talking point with friends. Bought these for my brother for Christmas- he has turned the 2nd bedroom in his condo into a "lounge/bar" and I thought these glasses would be a unique addition! Loved them so much I just bought 2 sets as gifts! I bought these as a gift for my husband several years ago and they're wonderful! We use them frequently and always get compliments when we entertain. They're so much more fun than trying to use a pen marker to differentiate glasses at parties ("I'm 'gluttony'!"). They are sturdy and feel great in your hand, and they've held up very well - still look brand-new. Just bought 2 more sets as Christmas gifts for friends this year because we love them so much! What a great product for someone hard to buy for!